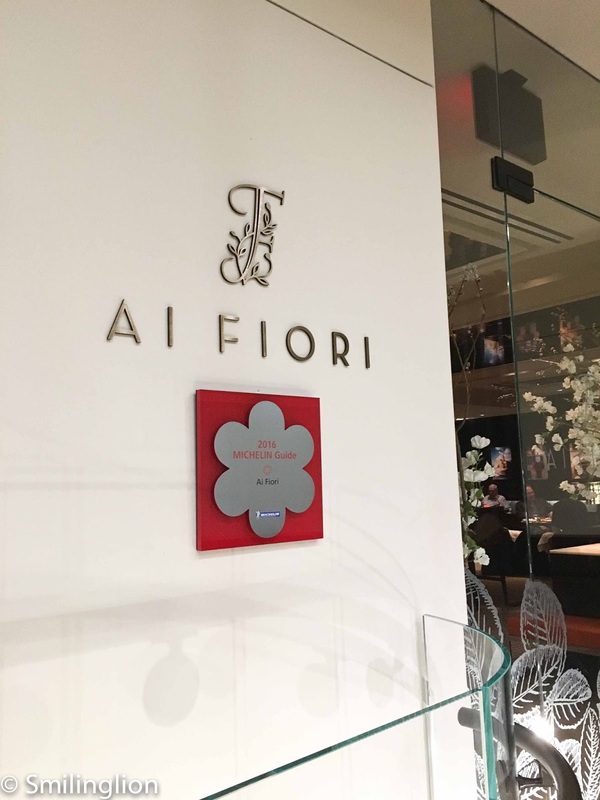 Our previous meal at Ai Fiori in 2012 wasn't that great so this time, it wasn't on our list of restaurants we wanted to visit. However, we had asked the waiter at Per Se the previous day for a recommendation of places to have a good pasta around where were staying in Midtown, and Ai Fiori came up. 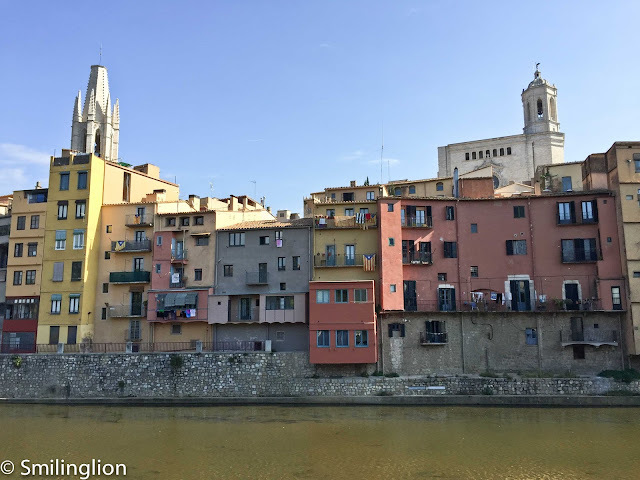 With the horrendous traffic we had experienced during the week in the city, a ten minute walk to a restaurant (rather than an almost hour long cab ride downtown in bad traffic which was what happened when we went to Atera) was a welcome change. Besides, we weren't in a mood for serious eating, having had such large and fantastic meals the past few days, so we were keen on a casual and comfortable restaurant to spend our Sunday night. Since our last visit, the Langham group took over the hotel management, but other than that, nothing much has changed. The restaurant still doubles up as the hotel breakfast restaurant in the morning, so there is an element of casualness to the dining room. 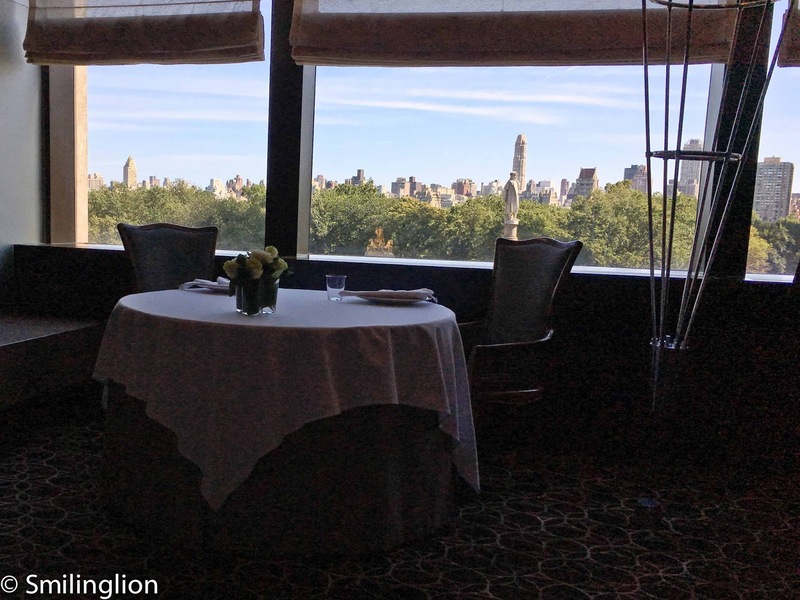 But the dining room was comfortable, with good views overlooking the bustling Fifth Avenue. In line with our desire to have a 'simple' meal, we decided to go with the a la carte menu. No big wines for us either, and we had a couple of negronis instead (these were very good). 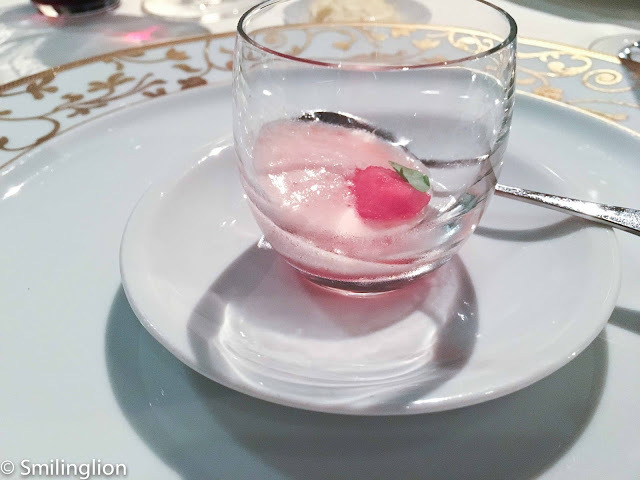 The amuse bouche of guacamole foam with watermelon was quite refreshing in its spiciness. 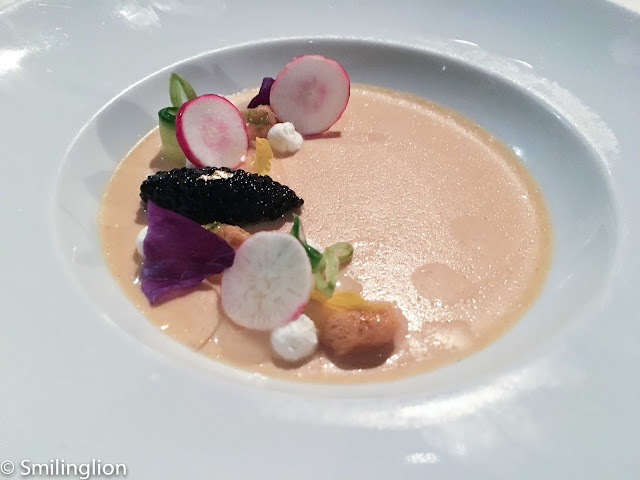 The Riccho di Mare (sea urchin panna cotta, lemon gel, créme fraiche and caviar) looked interesting so we ordered it. 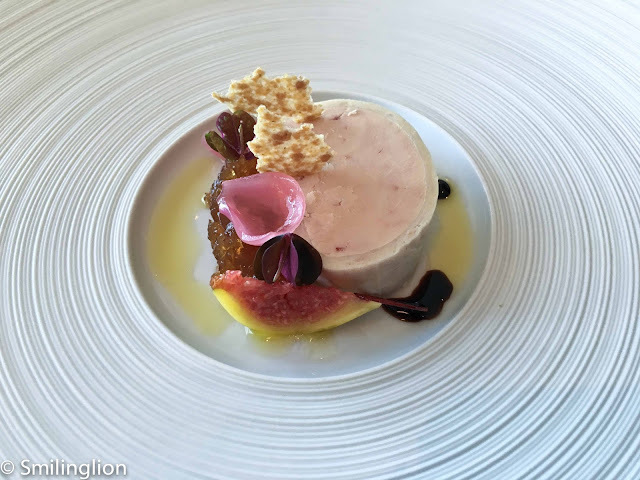 This was a good dish, though I felt that the panna cotta was a tad too big a portion and this would have been a more elegant dish if served in a small bowl or cup instead. We were here for the pasta and this didn't disappoint. 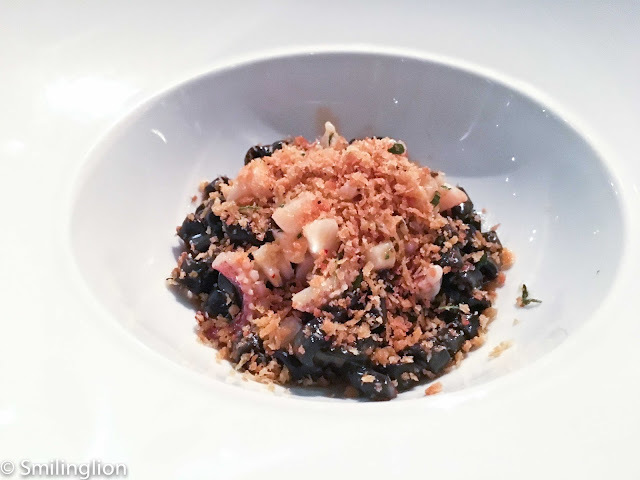 The classic Trofie Nero (ligurian crustacean ragu, seppia, scallops, spiced mollica) was even better than I remembered it. 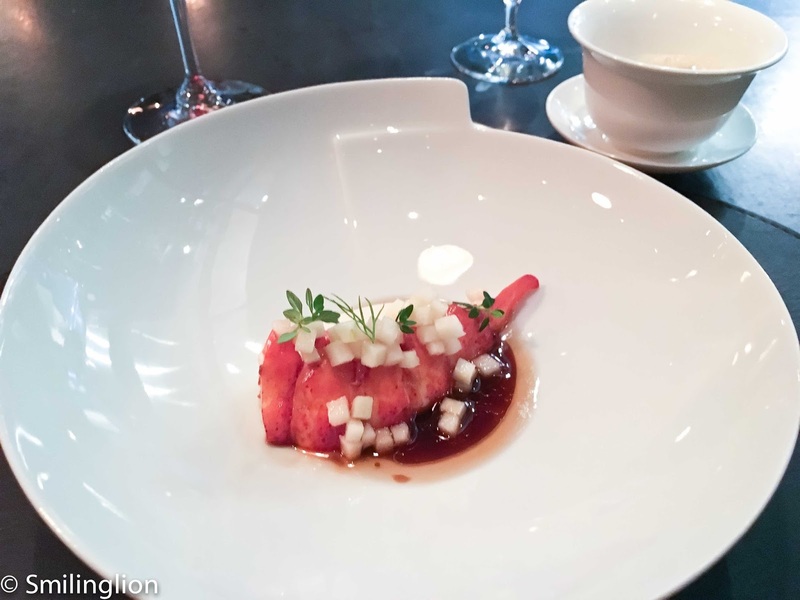 The rich lobster sauce was enhanced by the spiciness and the dried and crispy cuttlefish added more flavour to the dish. 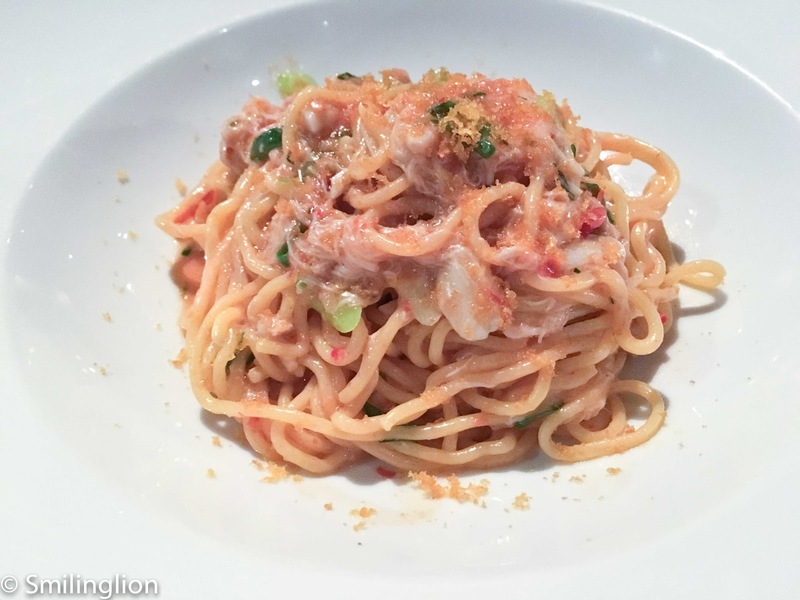 The Spaghetti (blue crab, lemon, bottarga, chilies) also hit the spot. For the second time, I was disappointed with the fish. 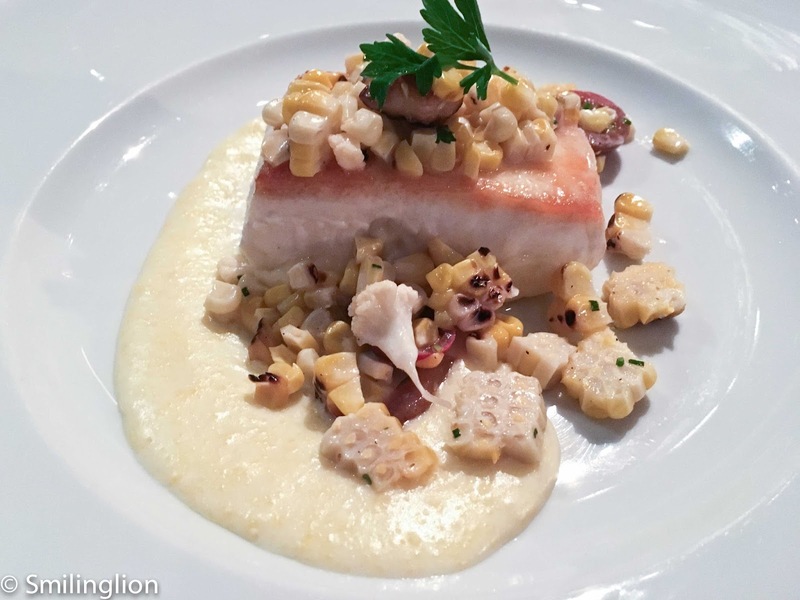 Similar to our last experience, the fish dish was overcooked, resulting in the halibut in the Ippoglosso (line-caught halibut, fava bean caponata, chanterelle mushrooms, zucchini purée) being too dry and tough. 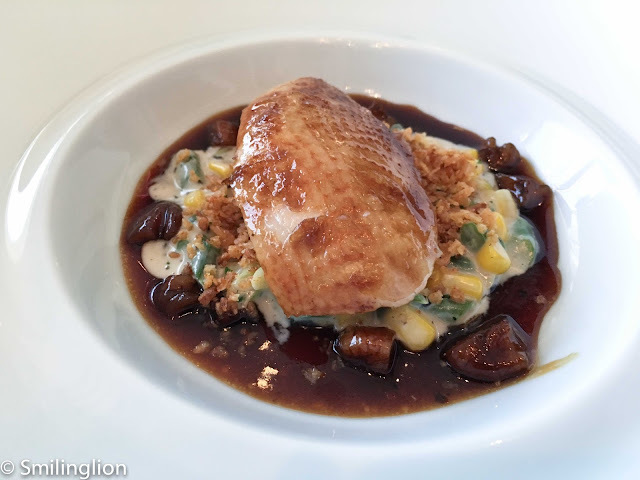 Fortunately, the use of sweetcorn and the mushrooms helped being some flavour to the dish, enabling me to finish slightly more than half of it. There were no dessert accidents this time (as there was when we had the awful rum baba the last time). 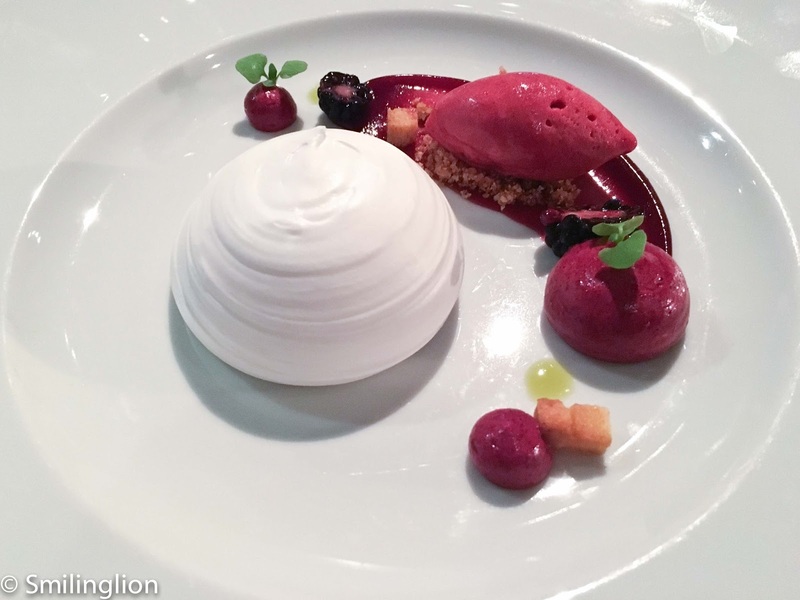 The Vacherin (blackberry-fennel, chantilly, sunflower seed, mixed berry sorbetto) was an ideal end to the meal. 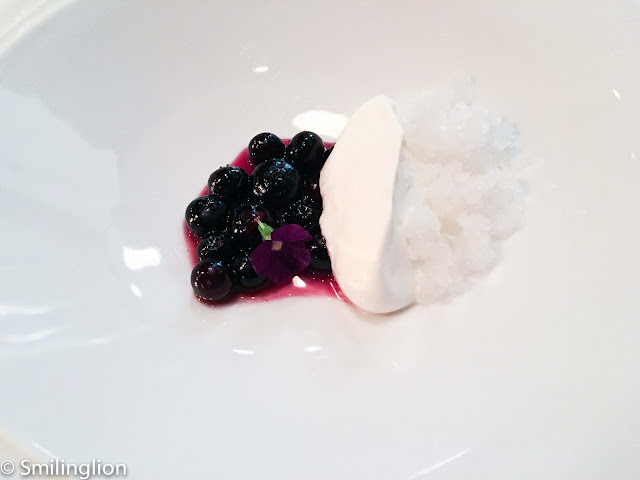 It was the type of simple Italian dessert which we love (with the copious use of berries and meringue). We had a good meal, with the pasta dishes the highlight of dinner. As a new empire rises, the incumbent inevitably declines as a result. And so as Daniel Humm of Eleven Madison Park ("EMP") takes over the mantle as arguably the most influential chef in New York City, one would expect Thomas Keller to start fading away. 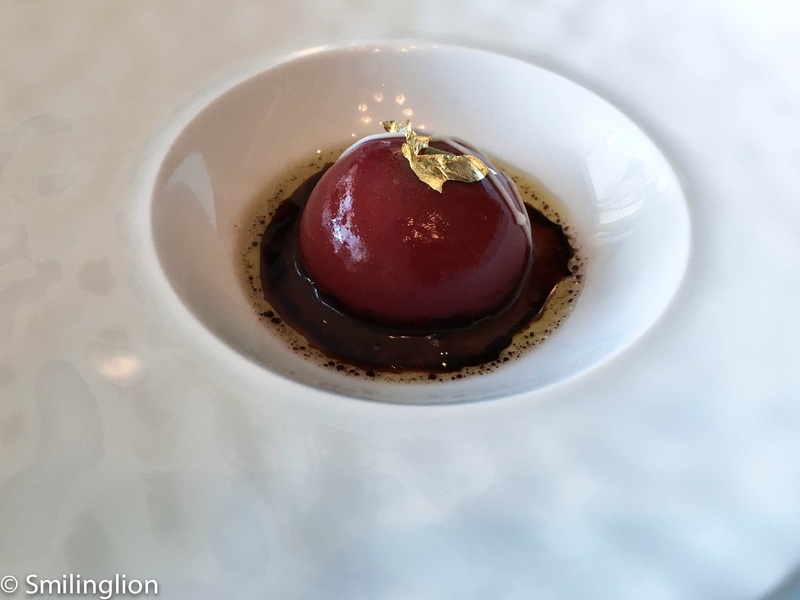 This is not a controversial notion, after all, Thomas Keller has dominated the US fine dining scene since the opening of his flagship French Laundry in Yountville, Napa in 1994. Moreover, with the passage of time, some of the alumni from his kitchen have become giants in their respective geographies, notably Corey Lee of Benu in San Francisco, Grant Achatz of Alinea in Chicago and Rene Redzepi of Noma in Copenhagen. A changing of guard is a natural progression of things, and it was against such a backdrop that we visited New York City this year and had the chance to dine at both EMP and Per Se again (in 2012 when we were last here, Per Se was the top dog and EMP was the young upstart, having just won its third Michelin star). This seemed to be further confirmed by the damning review from renowned New York Times ("NYT") critic, Pete Wells, in his uncompromising article in his paper in January earlier this year, where he unceremoniously dropped two stars from the four which Per Se had probably taken as a birthright for the last decade (the NYT ranks restaurants up to a maximum of four stars, in a rating system which is regarded in New York as having more credibility than the Michelin Guide). So when we got our reservation to have lunch here this time, we were both curious and trepidatious in equal measure: curious to see if and how Per Se would respond to the most public of dressing downs, and yet afraid that we would be wasting both time and money and be bitterly disappointed by the experience. The last time we dined here, it was dinner and the ambience was quite different. 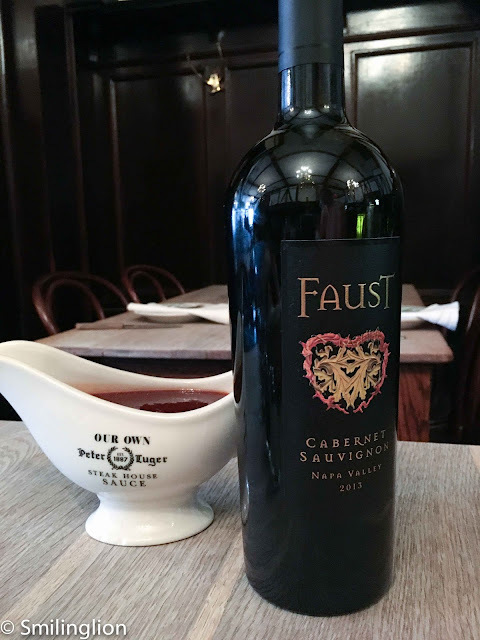 Then, there was a very formal and older crowd, with the crackling fireplace (it was during the depths of winter) providing warmth in a toasty and dimly-lit dining room. 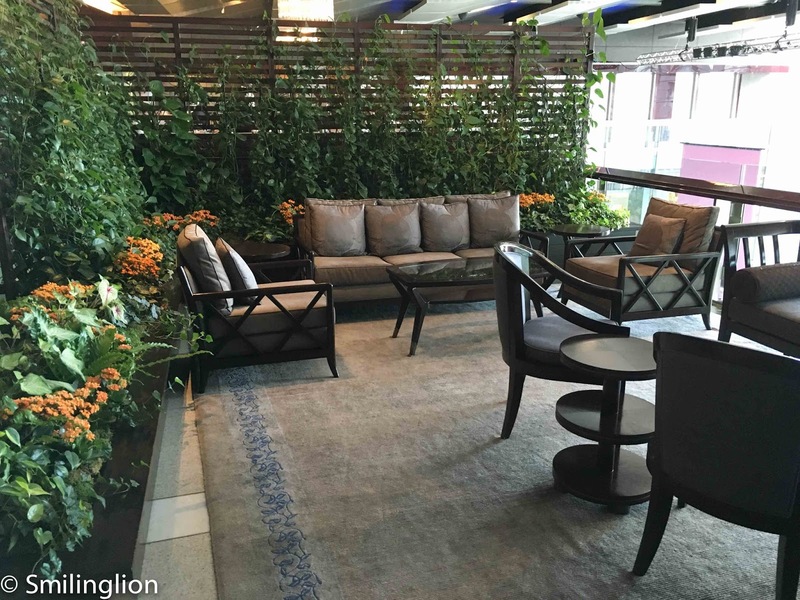 This time, it was a gloriously bright and warm early autumn midday, and the atmosphere was much more relaxed, with a few tables even seating young children. We had asked for and were given a table with a nice view of the New York skyline and overlooking Central Park. 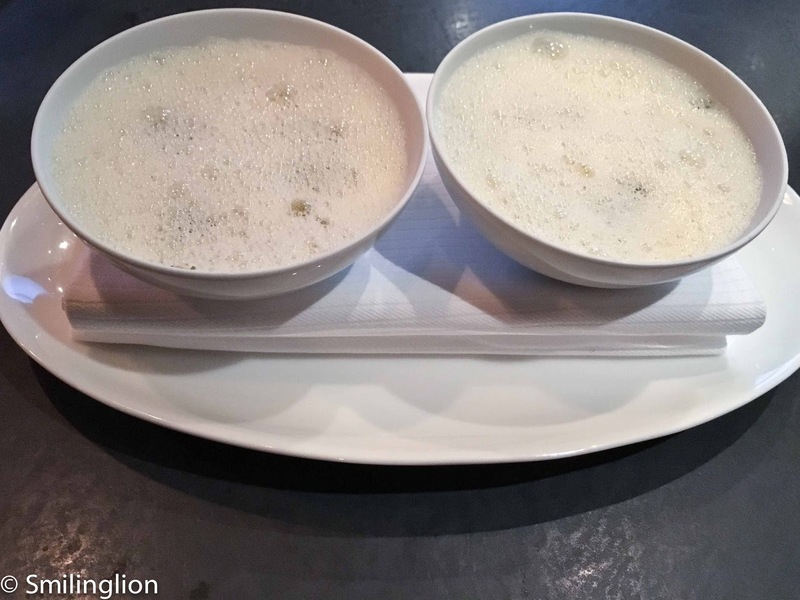 One of the subtle differences we noticed in our dining experiences in New York this time round was that all the fine dining restaurants we have been to no longer automatically offer champagne at the start of the meal. This could be a movement away from the usual French formal style of dining, with New York restaurants eschewing the snobbery associated with soft-pressurising guests to spend $40 on a glass of bubbly even before they have a chance to look at the menu. In fact, it also surprised us that most of these restaurants even offer tap water without being asked, which is a far cry from the days when the waiter would look upon a guest asking for tap water as if he was Oliver Twist asking for a bowl of soup. 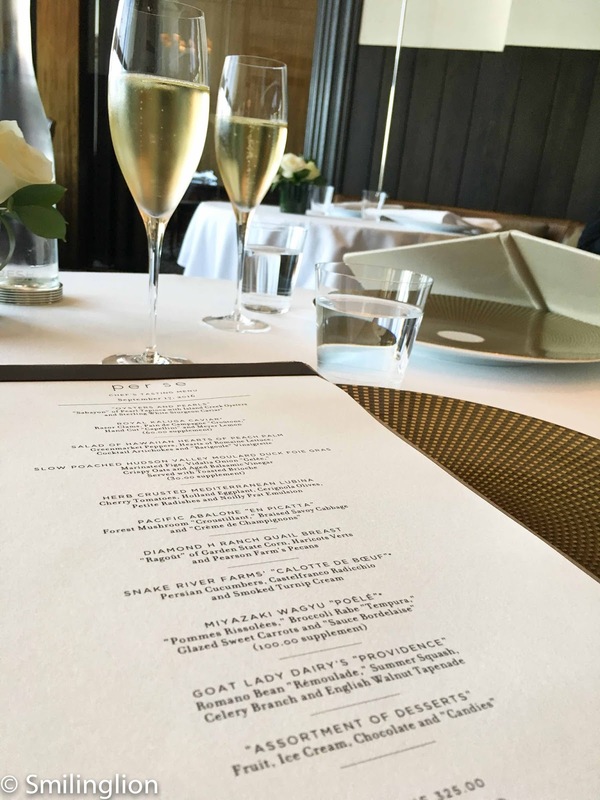 Nonetheless, there is a time and place for champagne, and in a classy restaurant like Per Se and on a day as perfect as this one, we felt that it was appropriate to start off with a glass of Blanc de Blanc. With our champagne, we were served one of the French Laundry and Per Se classics, the cornet with salmon tartare and crème fraiche. 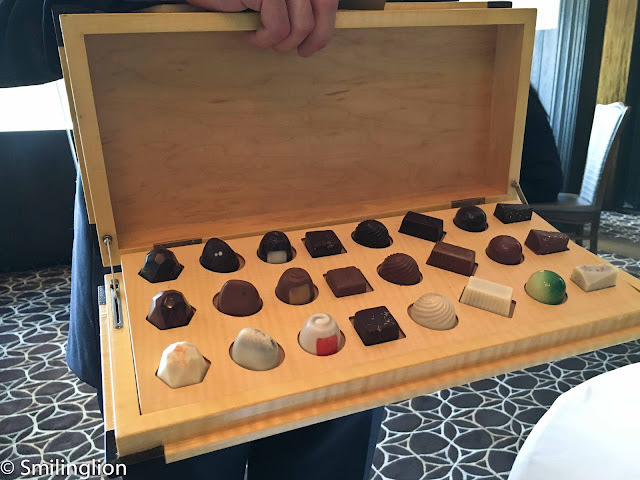 One of the recent innovations in fine dining is the use of the iPad in place of the traditional wine list in a book. Aside from the fun I usually have handling a phone directory-sized encyclopedia of wine, when I go through the list, I sometimes keep my finger on a few pages which have wines I have identified, so that I can go back to those pages when I need to decide. I can't do that with the iPad, annoyingly so. But I digress. The Per Se wine list (though it comes in an iPad) is very impressive, and reassuringly contains a wide selection of American wines from which I selected a 2007 Spring Mountain Napa Cabernet Sauvignon which was an excellent wine. 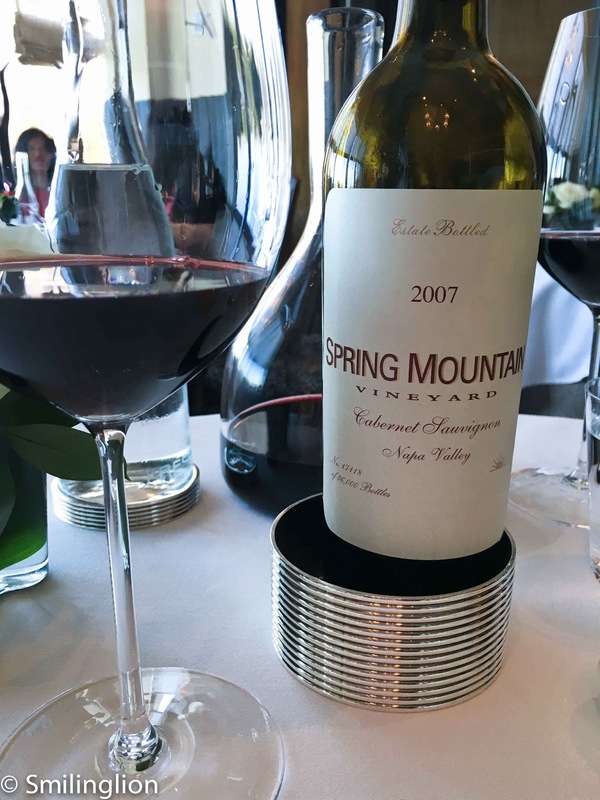 One thing which has surprised me on this trip is the relatively small number of American wines in most wine lists (Per Se being the exception), which seem to be dominated by French and Italian labels. 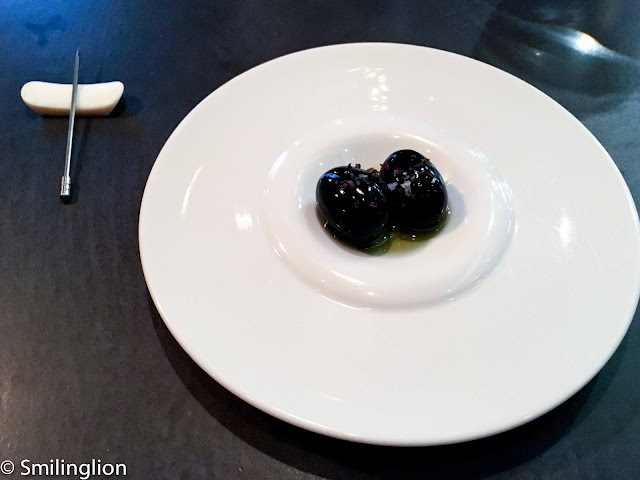 The first course was a choice between the famous Oysters and Pearls, which we have had before twice, and the Royal Kaluga Caviar, which we opted for this time. 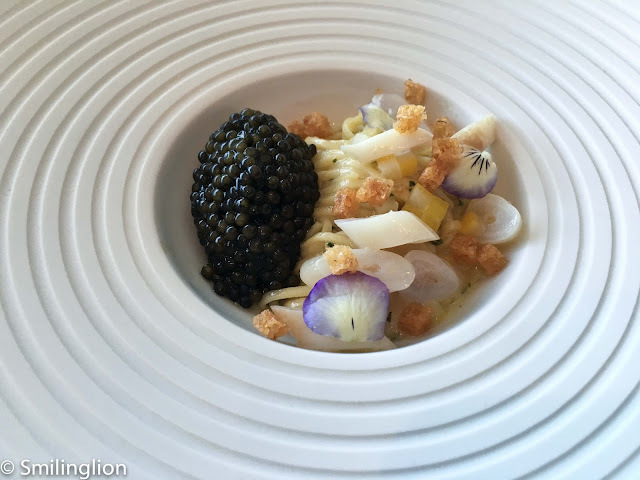 This was an amazing dish of the most generous dollop of caviar, on a bed of razor clams, Pain de Campagne "Croutons", hand-cut "Cappellini" and Meyer lemon. 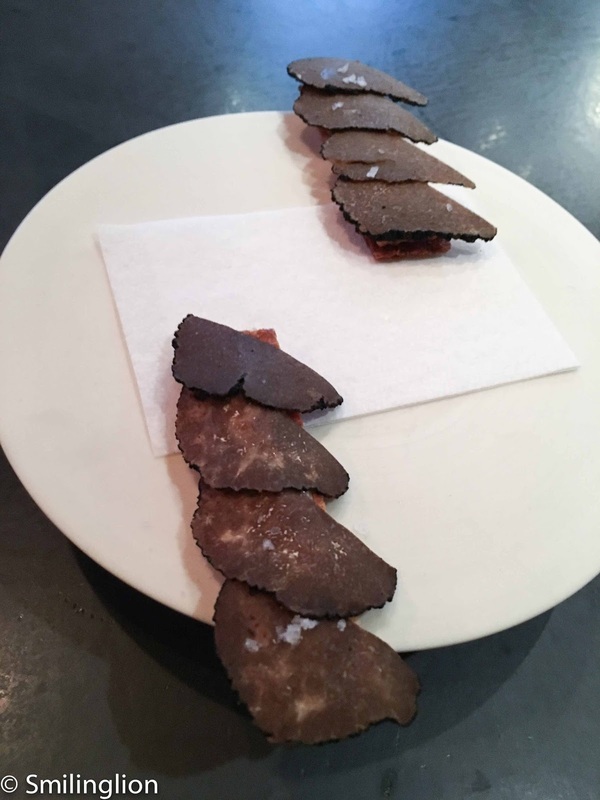 Another old favourite was the Slow poached Hudson Valley Moulard duck foie gras. This was paired with a delicious chocolate brioche and six kinds of salt (each one of which we tried with the foie gras). This time the foie gras had less pungent flavours than we were used to; it tasted a bit more like a chicken liver. The marinated figs, Visalia onion "geleé"; crispy oats and aged balsamic vinegar were appropriate accompaniments to the liver. 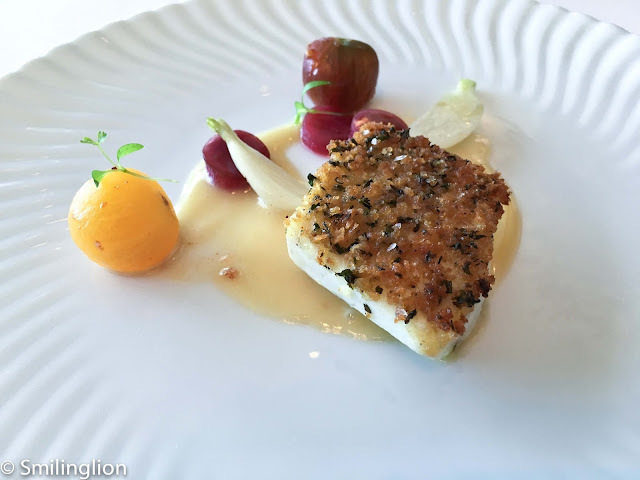 The Herb crusted Mediterranean lubina with cherry tomatoes, Holland eggplant, Cerignola olives, petite radishes and Noilly Prat (a type of vermouth) emulsion was a wonderful fish dish. One of the highlight of the meal was the impressive Pacific abalone "En Picatta". 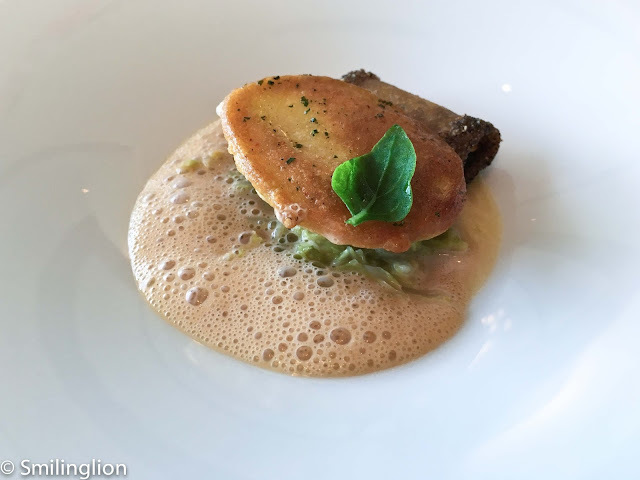 The abalone was so soft and fresh without being too chewy, and the earthy flavours brought about by the "Créme de Champignons", the sourness provided by the "Braised Savoy cabbage" and the crispiness from the Pacific Mushroom "Croustillant" completed the perfect dish. The meal got better with the incredible Diamond H Ranch quail breast which was tender and juicy on it own but was brought to another level by the deep umami flavours of the deglaze, the "ragout" of Garden State corn, Haricots Verts (fancy term for green beans) and Pearson Farm's pecans. 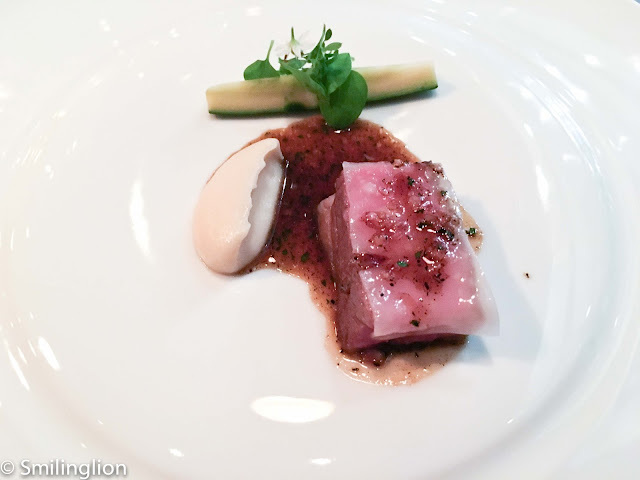 The Snake River Farms "Calotte de Boeuf" was a rough cut of beef which was so full of flavour and jus that the accompanying Persian cucumbers, Castelfranco radicchio and smoked turnip cream seemed to be added to restrain it. This was brilliant, and together with the quail dish, was able to bring out the best in our Napa Cabernet Sauvignon. 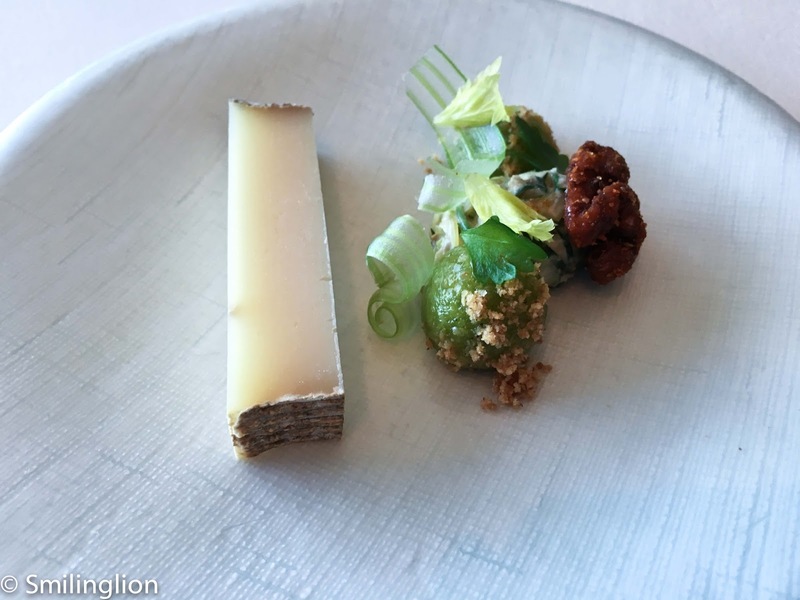 From memory, neither Per Se nor French Laundry do the traditional cheese course whereby we get to choose what cheese we get. Instead, 'cheese course' here means a curated course of one type of cheese (usually cheese from a neighbouring area). And so it was here as well. This was a Goat Lady Dairy's "Providence" with Romano bean "Rémoulade", summer squash, celery branch and English walnut tapenade. Desserts this time seemed a bit more casual than before. 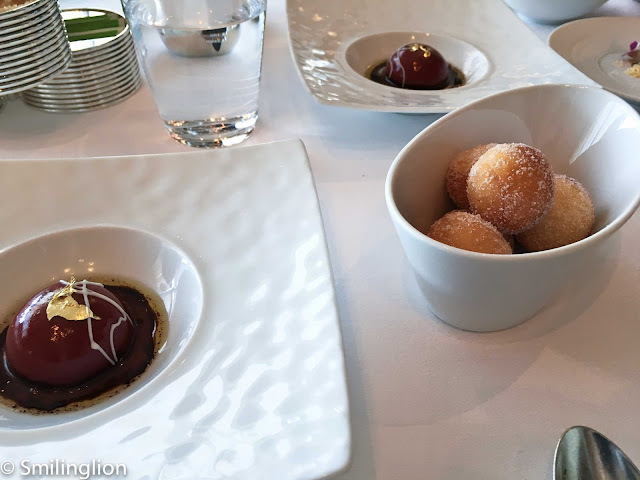 Instead of course after course of elaborate creations, this time, all three desserts were served in small plates at the same time. 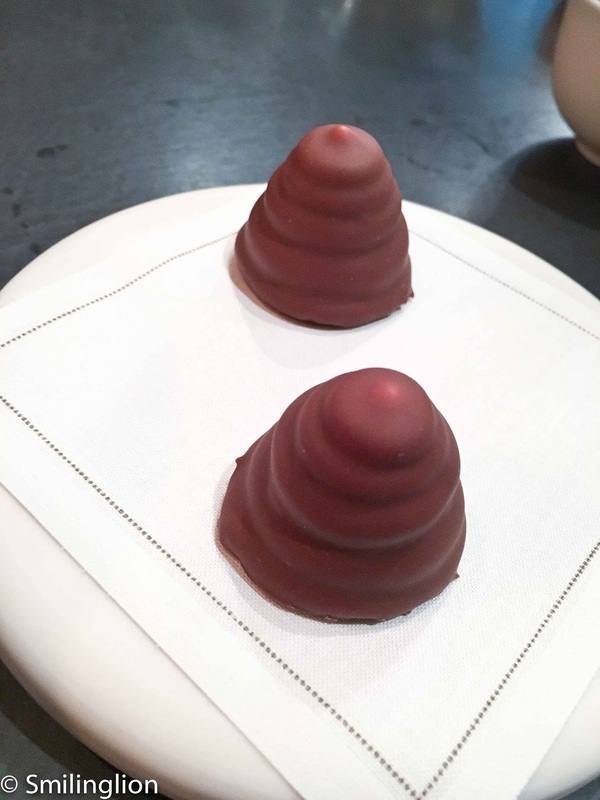 Not that we minded, the first was a madeline with blueberries and pear, the second was a peanut butter ice-cream sandwich and lastly a raspberry-glazed hazelnut praline. They were all very good. Coffee was accompanied with the old favourite of "Coffee and Doughnuts", and a choice of chocolates and pralines from an impressive selection. This was the end of a hugely enjoyable meal. 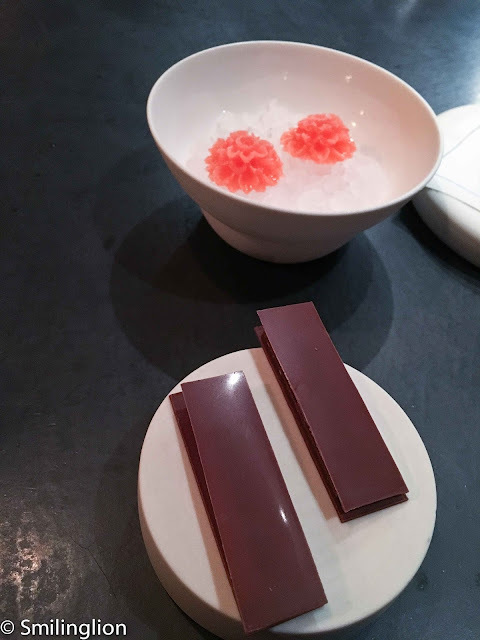 True, the food was not as cutting-edge as Atera, neither did it push the boundaries like EMP, but Per Se did familiar flavours with such finesse that we would describe the meal as flawless. But it wasn't just the food. The service levels throughout our time there were at peak levels; the service staff weren't just precise and professional, they were warm and friendly as well. A few of them were able to engage us in interesting conversation which spoke of their genuine desire to provide their guests with a comfortable and involved dining experience. 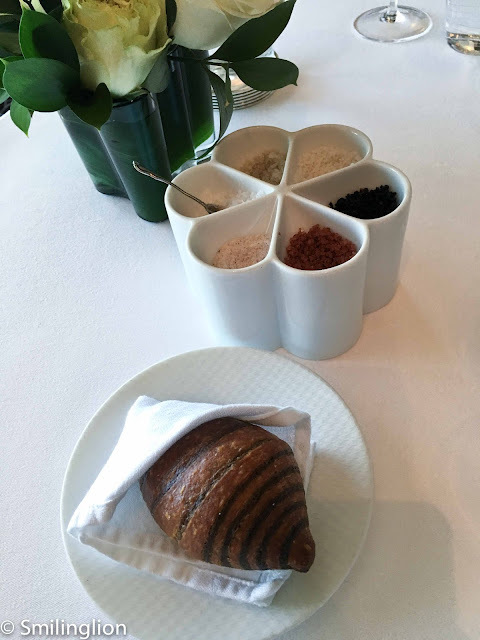 When we left New York in 2012, our most memorable meal during that trip was at Per Se. As we leave New York again this time, Per Se is once again the most outstanding meal this time. If this wonderful experience is the direct result of the January NYT article, then we owe Pete Wells a nice meal. 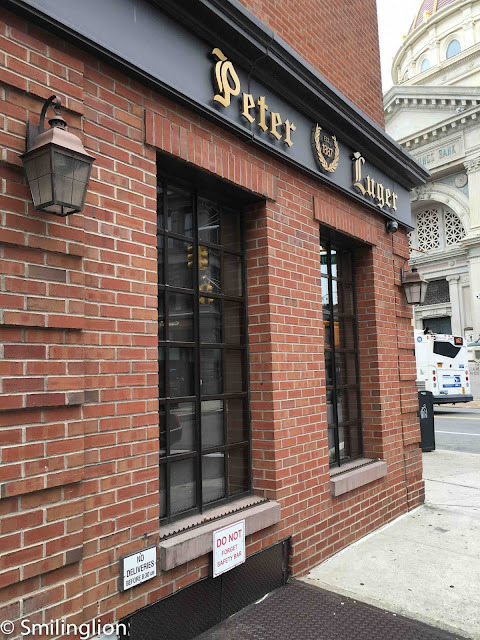 The last time we were at Peter Luger, it was a cold and drizzly Monday noon. There never was much of a crowd on that day as a result. This time though, on a warm sunny Sunday lunch, there was a queue round the block already by the time we got there. Fortunately, the queue for those with reservations was quite short, and we were seated almost immediately once the doors opened. Having a steak lunch seems like a popular family affair over here, with most groups of people here with their families, though like the last time, there was a large number of Asian tourists as well (especially the Japanese, though I can never really understand their fascination with Peter Luger, given the abundance and quality of steakhouses in Japan with their super premium Wagyu beef). This time we didn't fail to order the famous bacon. 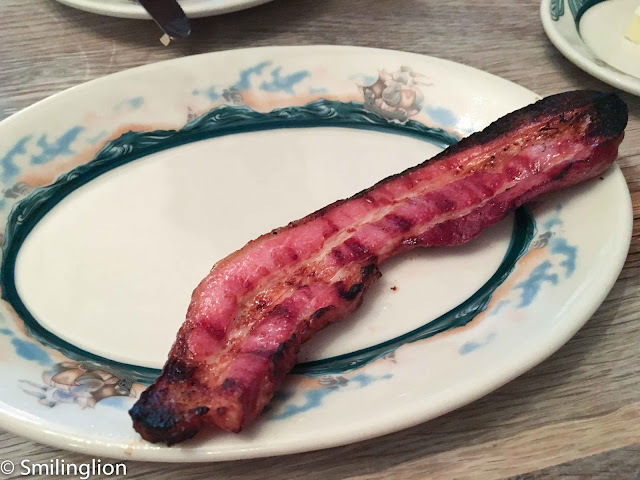 This was a long and thick strip of charred bacon which was incredibly tasty with a unforgettable smoky flavour. We would have ordered more of it if we weren't rationing our stomach space for the humongous steak which was to be served. 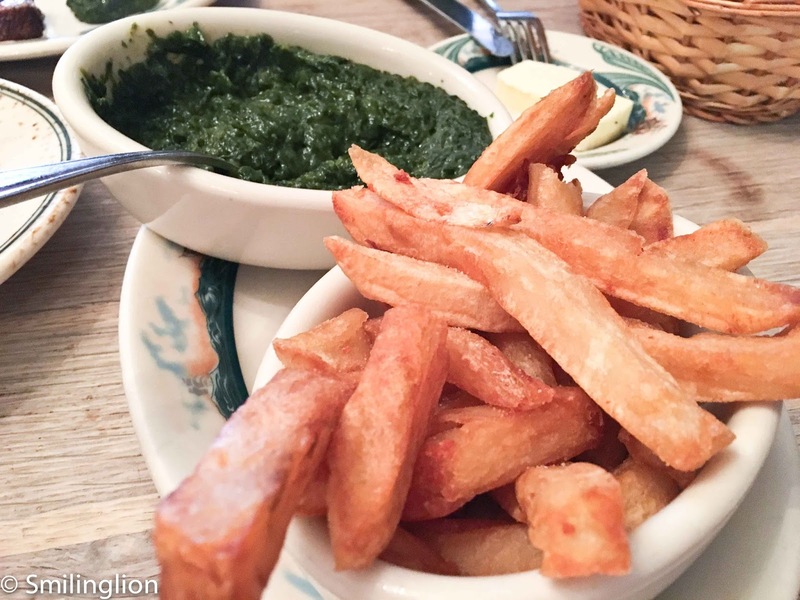 Another favourite of ours here was the creamed spinach. 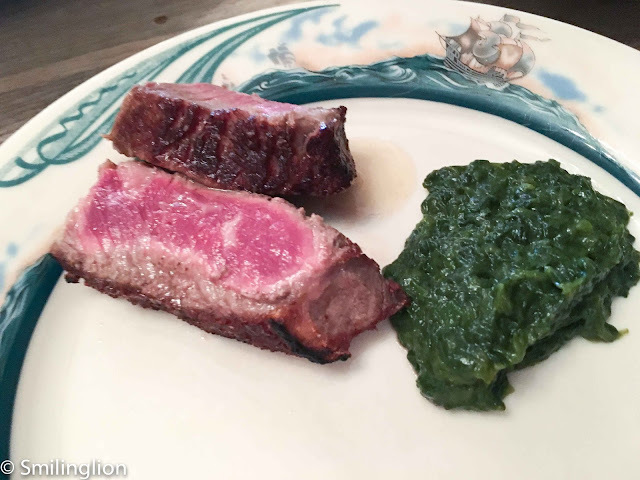 Arguably more special than the steak itself, this is probably the best creamed spinach we have ever eaten. It was smooth and creamy without the bitterness usually found in similar spinach dishes. The porterhouse steak was as good as we remembered it, and it was served the same way: the porterhouse was sliced up in the kitchen and when brought to our table, the plate was propped up on an inverted saucer at an angle to collect the jus from the fat at one end of the dish. The waiter would then pick two pieces of beef to put on our plate, use a spoon to scoop up some of the jus and lather the beef with it. 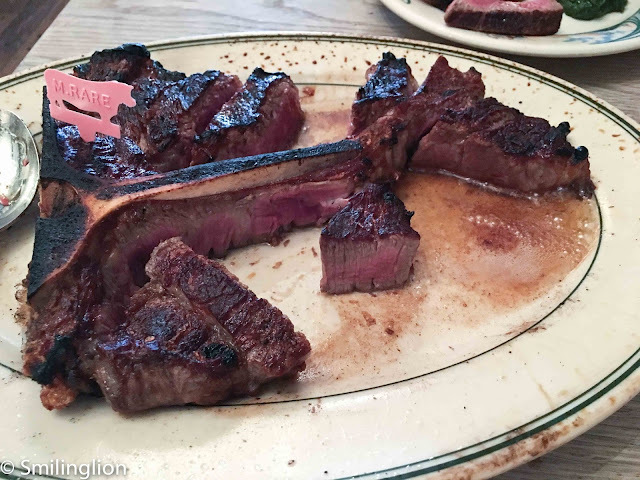 The beef used at Peter Luger is top grade USDA short loin which they age for around a month. The result was a quintessentially New York steak flavoured by its own melted fat and some salt. 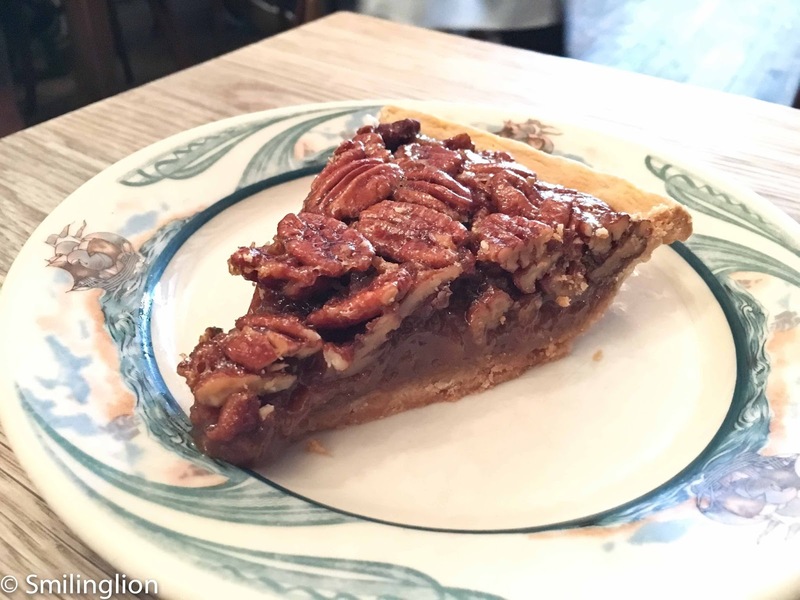 We still had a bit of space for dessert so we ordered the popular pecan pie as well. It was an traditional and familiar comfort dessert which was excellent. Like the last time, we had excellent service, in contrast to the reputation this place has for curt and rude service. Our waiter was friendly and gracious throughout, and it was an enjoyable lunch that day. Atera is a niche restaurant in Tribeca which focuses on creative modern european cuisine. It is located in the Tribeca neighbourhood of Manhattan and takes up a small first-floor space in a shophouse which also accommodates a vet and dog daycare centre. 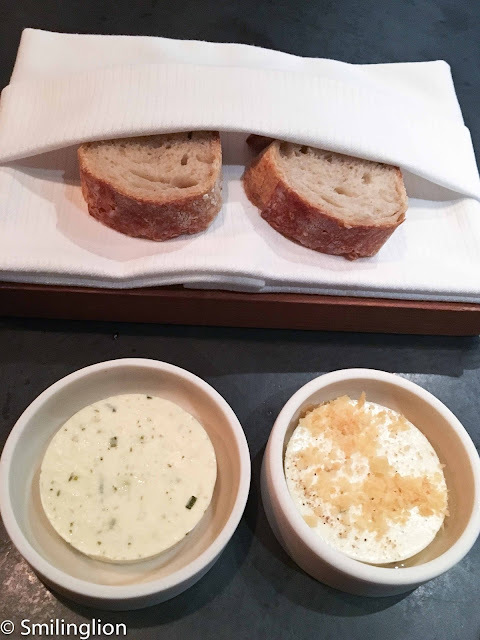 A holder of two Michelin stars, it survived a change in chef when the previous maestro Matthew Lighter left last year to pursue other opportunities. 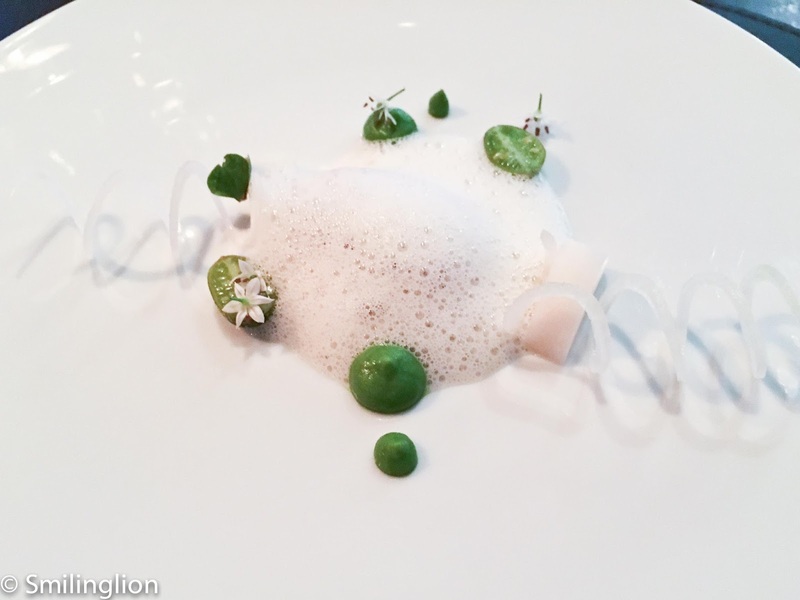 New chef, Ronny Emborg, a Danish national who cut his teeth in El Bulli, Mugaritz (where he actually worked in the same kitchen as Matthew Lighter) and AOC, took over during the middle of last year. 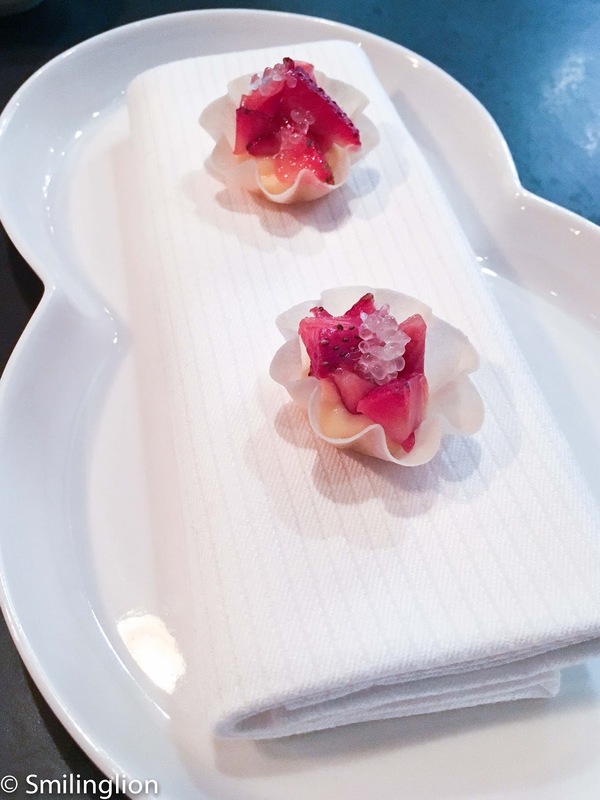 The 15-seater counter-only restaurant can be a daunting stage for any new chef, especially one as young (he is in his early thirties) and foreign as Chef Ronny. This is particularly because all the cooking and plating is done in that small open kitchen (unlike many other restaurants with similar counter dining concepts but with a separate or separated 'wet' kitchen area for heavier cooking). With a single tasting menu only, Chef Ronny and his three chefs and one sommelier work in that confined space to serve up dinners which stretch to almost twenty courses, decant and serve the wines and prepare the tea and coffee under the scrutiny of the guests. Despite the all-counter seating, we were very comfortable in our high-chairs throughout dinner. The atmosphere was quite relaxed, with a well-curated contemporary soundtrack of music which was played at just the right volume to create the ambience of a discreet lounge. But in contrast, there was an intensity in the kitchen staff which demonstrated their extreme focus in preparing and serving the food in a military precision to ensure that all the dishes came out exact. It was like watching a surgical team performing an open heart surgery. But this intensity was not without style. 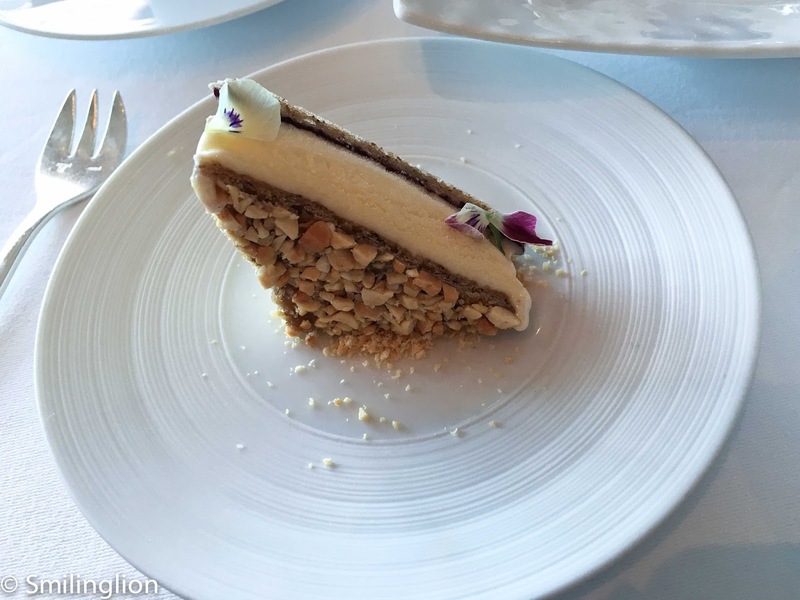 Chef Ronny and his team exuded a swagger of a group of professionals who excel at their tasks and know it, against the backdrop of cool music. It didn't hurt that the entire team was, without exception, good looking and über cool (especially the ridiculously cool maitre d with the ponytail). All these would be sheer vanity if the food wasn't any good. But the food was good, by Odin was it good. For the next two hours, we were treated to a meal of the highest quality and imagination. Chef Ronny's manipulation of flavours, textures and even temperatures was masterful, and every course was finished off by us with relish overtaken only by our anticipation for the next dish. And the service was slick, with interesting touches of originality like using a shaving brush to sweep breadcrumbs off our tabletop (clearly they don't need it for anything else given that a beard is a requirement for employment in this restaurant if you are a man). Dinner commenced with a shot of juniper and lime essence. This was followed by the next four courses of Waffle - mushroom, summer truffle, Foie gras - corn, lemon verbena, Olives Grapes (which was actually black grapes which looked like olives but were covered with olive oil) and Golden Osetra caviar - pistachio, beer. 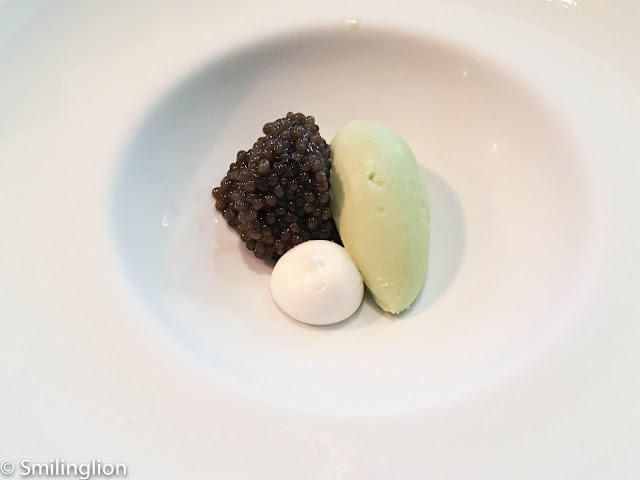 They were superb but the caviar stood out for the brilliant pairing of of the luxurious roe with pistachio ice cream. Despite the availability of various type of beverage pairings, including wine pairings, a temperance pairing (i.e. 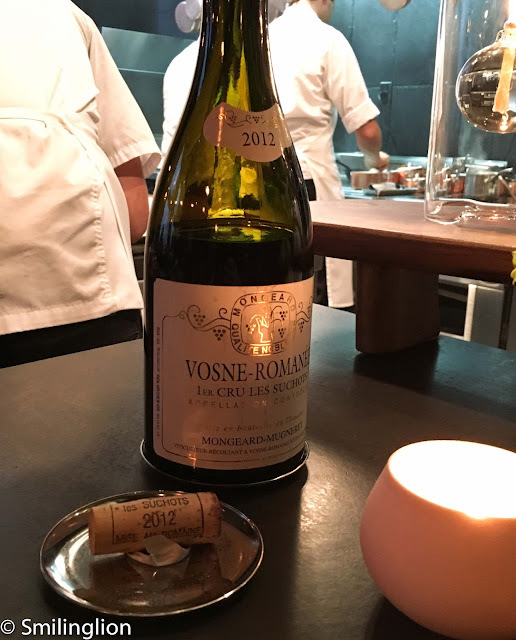 non-alcoholic pairing of juices) and even a tea pairing, we went old fashioned and ordered a Burgundy in the form of a 2012 Vosne Romanee 1er Cru Les Suchot from Mongeard-Mugneret, which we have had before and worked like a treat again for this meal. The Mackerel - cucumber, horseradish was a dish full of umami, with the warm dashi, cucumber sorbet and horseradish powder a demonstration of the successful pairing of flavours, textures and temperatures. 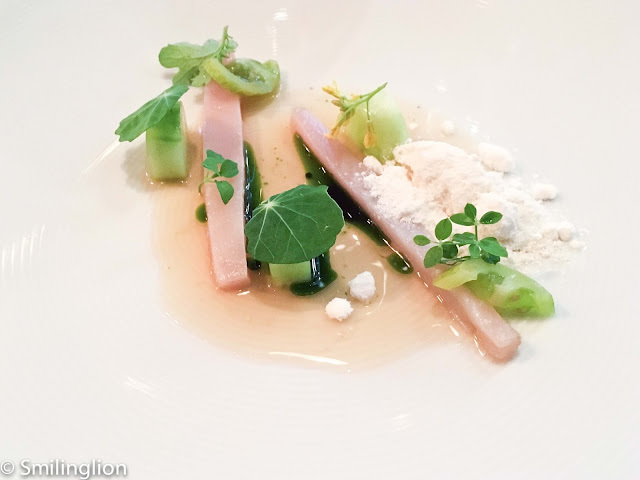 The Oyster - Kohlrabi, thyme and Lobster - celeriac, yuzu continued the theme of light seafood dishes with splashes of brine and distinctive sauces balanced out by the use of fruit (green tomato in the case of the oyster and yuzu for the lobster). The accompanying bread was sourdough and unsalted butter with cheese flakes and a cream which had a curd-like texture. The meal reached its crescendo for the main courses. 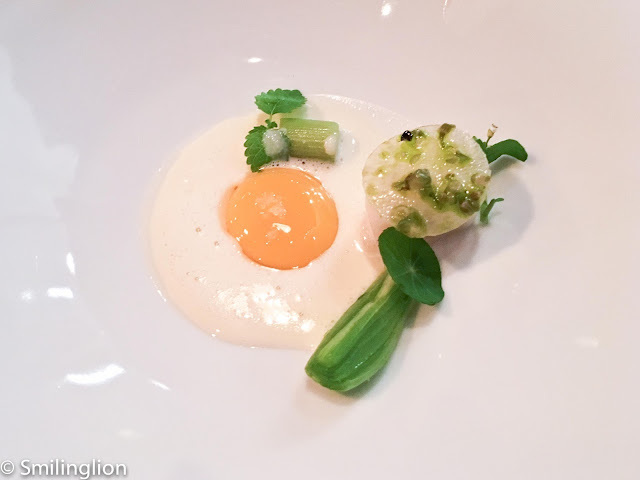 The Summer vegetables - yolk, cheddar was a single quail egg yolk on a plate of vegetables. The chef poured a light cheddar cheese sauce onto it, making it resemble a fried egg. This was simply divine. The Squab - green bean, blackcurrant was probably one of the best game dishes we have ever eaten. 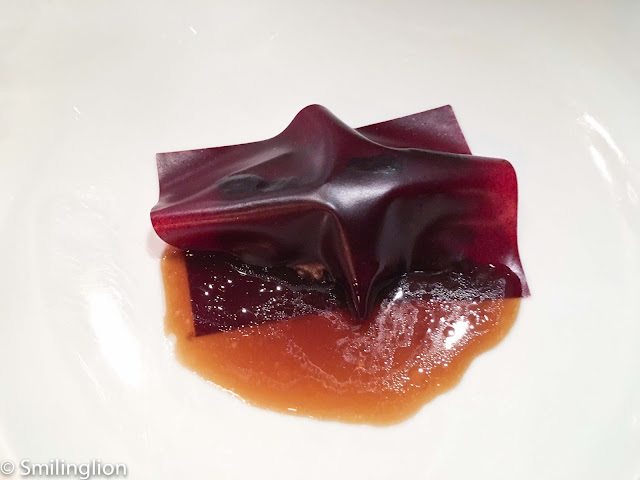 The use of the blackcurrant jelly sheet to take the edge off the gamey flavour of the bird breast was quite genius. 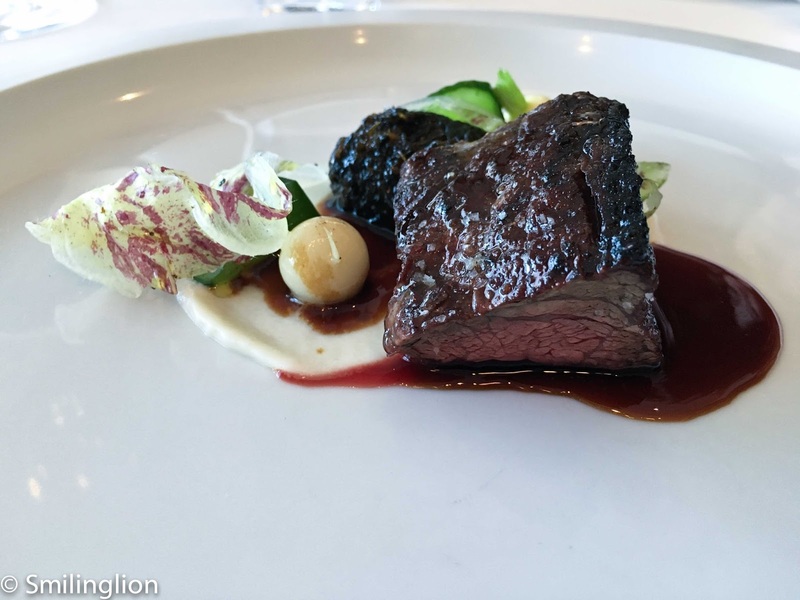 And finally, the Beef - zucchini, Allium which was perfection in itself. The desserts were no disappointments either. 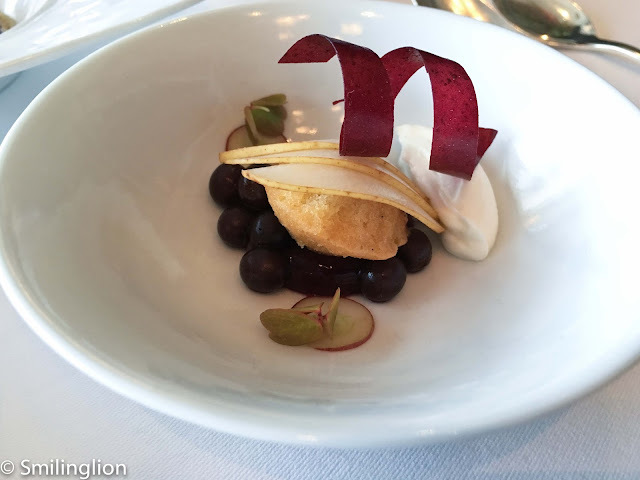 The Toasted hay - raspberry and Blueberry - lemon, elderflower were my favourite type of light fruit-based desserts. Even after the main dishes, the meal did not let up. 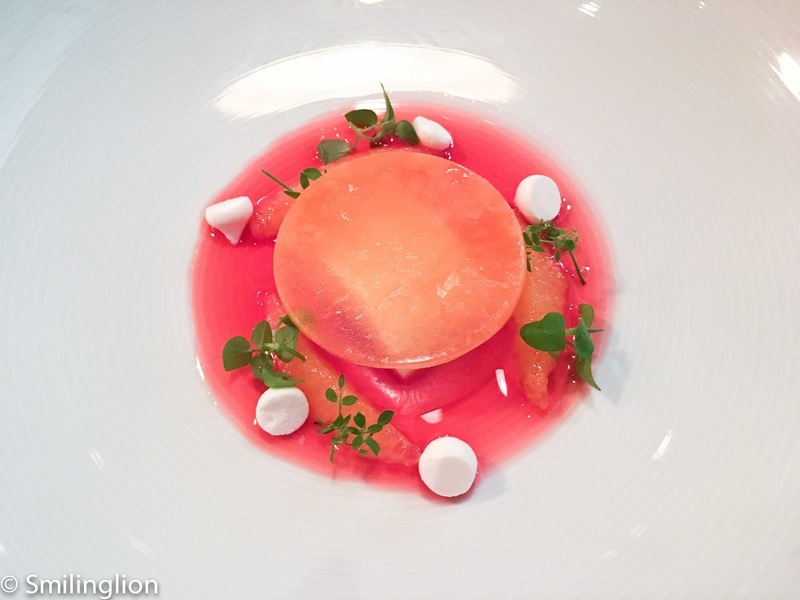 The Peach flower and Miso caramel, Flødeboller (a Danish chocolate-covered marshmallow) and Strawberry tart showed a lot of effort and creativity by the kitchen. 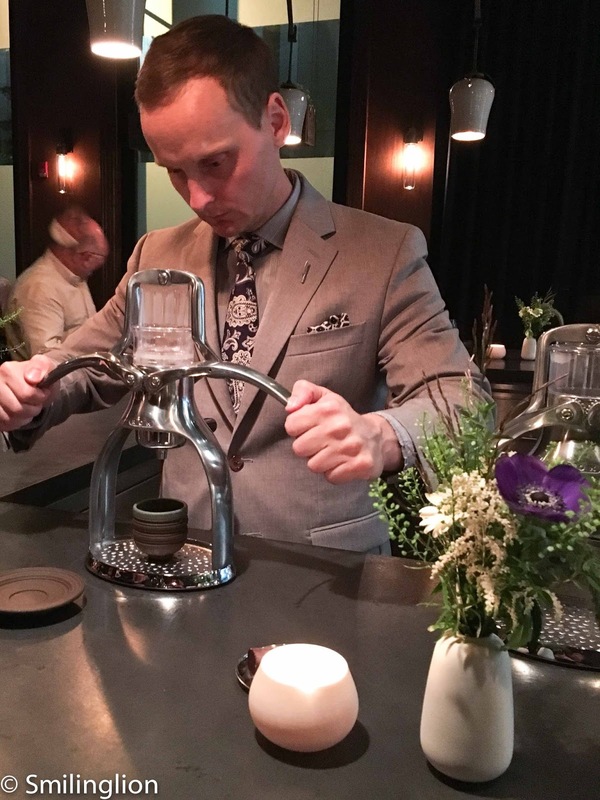 To top it off, a post-dinner order of tea and coffee then resulted in an elaborate tea and coffee-making ritual by the sommelier in front of us, with a level of choreography which would put a traditional Japanese green tea ceremony to shame. 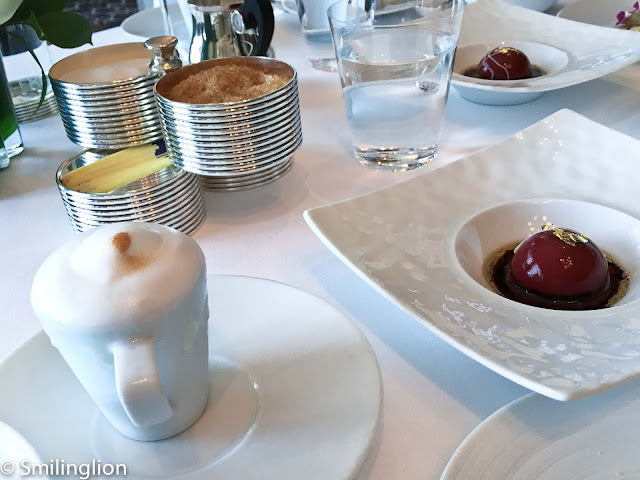 The quality of our meal and the dining experience that night was of the highest order. The attention to detail in each of the courses was very impressive, and given our physical closeness to the chefs in the kitchen and our ability to scrutinise every dish they were preparing, it was as if we were passive participants in a two-hour long performance art piece. I would compare it to being in a small audience sitting around a string quartet on stage watching them perform a technically difficult piece of music for the length of time, where the audience are close enough to look over the shoulders to read the music scores while the players are performing. 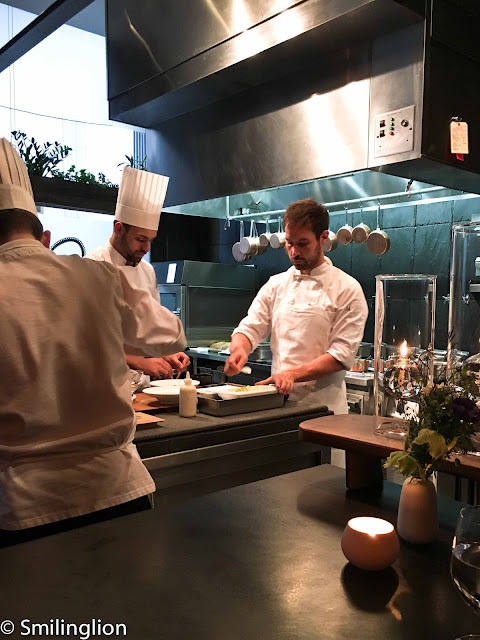 It is no wonder that the chefs, despite their efforts to be friendly with their guests, looked like they bore a lot of stress in executing their cuisine to perfection and trying to look cool at the same time. 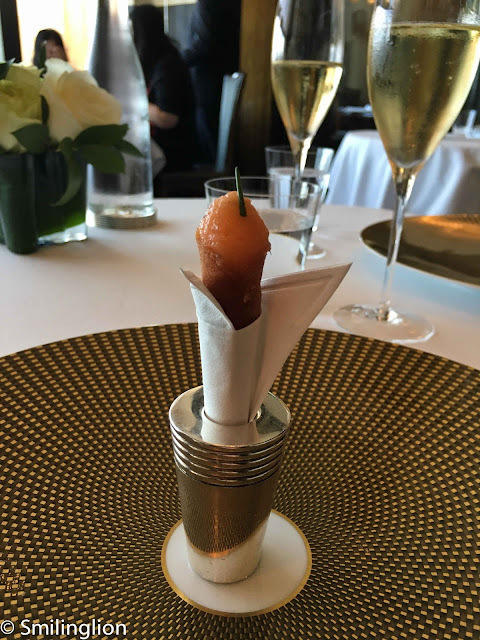 We were impressed at Eleven Madison Park at dinner the previous night but this meal at Atera eclipsed that with its unique dining experience and originality.